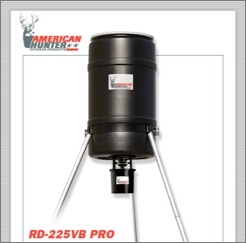 225 lb RD-225PROVB Deer Feeder. 225 lb. Capacity Feeder has a heavy duty poly barrel with a quick release lid and heavy metal leg mounts. The adjustable feed rate is 1 to 30 seconds and has a built-in Varmint Guard. Prewired for Varmint Buster #BL-VB1, Remote Control #BL-RC-1, Solar Panel #BL-R680-S.